Mounting raised panel shutters along window frames adds traditional charm. 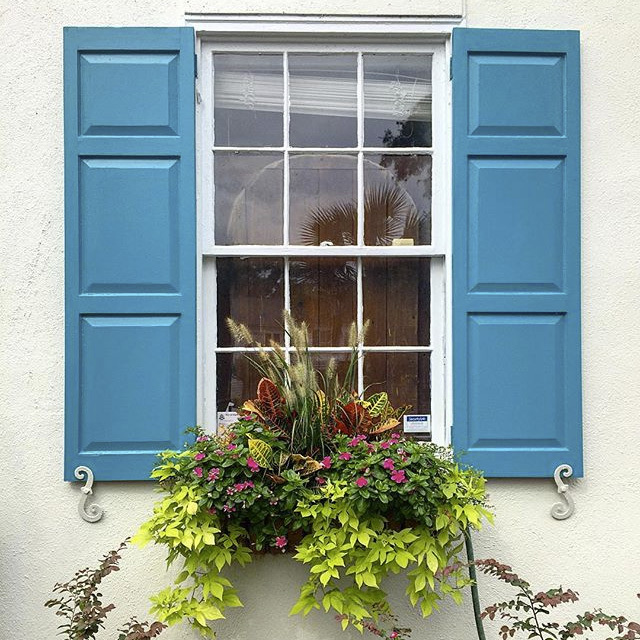 An always-beloved design, paneled shutters are found on homes nationwide. From a suburban single-family ranch to an urban brownstone home, raised panel exterior shutters draw attention to windows and enhance architectural features. Raised panel exterior shutters are manufactured and supplied by Hooks and Lattice including custom wood shutters, composite, vinyl and fiberglass shutter sets. A wide range of different styles of shutters in sizes down to 1/8" manufacturing accuracy are available in fiberglass and wood composite. For decorative-only affordable paneled shutters, vinyl is a low-cost, durable and attractive option. Exterior raised panel shutters can also be purchased in operable form made from natural cedar wood, composite or fiberglass. Although shutter pairs are sold standard as decorative mount only, mounting hardware and hinges to create working shutters are available for separate purchase. Raised panel exterior shutters are a time-honored addition to home architecture. Influenced by colonial design, paneled shutters have a warm and traditional feel. By mounting to frame small windows, Williamsburg shutters give off the illusion of grander size. This more distinguished look also adds to the overall impression of a home from the outside, resulting in a positive impact on resale value due to added curb appeal. At Hooks and Lattice, exterior raised panel shutters are manufactured and supplied. Our website features products broken out into categories according to material. In each material, paneled window shutters can be found in different designs, sizes and color/finish options. You can also shop by shutter style or design. If you know you want Raised Panel or Flat Panel design shutters, sick with that and browse material types. While many customers are turning to wood alternatives like vinyl, fiberglass and composite, traditionalists who still prefer natural wood have the option of our Cedar Paneled Shutters. Most of the outdoor shutters featured in this section are sold standard with decorative-only mounting. This means shutter pairs are designed to install against home or building walls and lie flat without the option to open and close. For working and swinging shutter doors, most raised panel shutters can be purchased with functional hardware and hinges to make them operable. For a bit of variety, these outdoor house shutters can also be paired with a louvered design for a smart combined aesthetic. Available to view in our "Combination Exterior Shutters" product category, this is a happy medium for homeowners and architects looking for a chic combination of two beloved styles. Raised panel shutters can also be utilized on the main level of a home, and louvered screens reserved for the second floor - as was the traditional practice. Raised panels provide protection and privacy, while the louvered style allows for shading and air circulation on second story windows. Browse online from products featured online and for custom paneled shutters in other sizes, styles or colors, please email us or call Hooks and Lattice toll free to discuss design and pricing. We have in-house designers on staff to help you find the perfect look for your home!